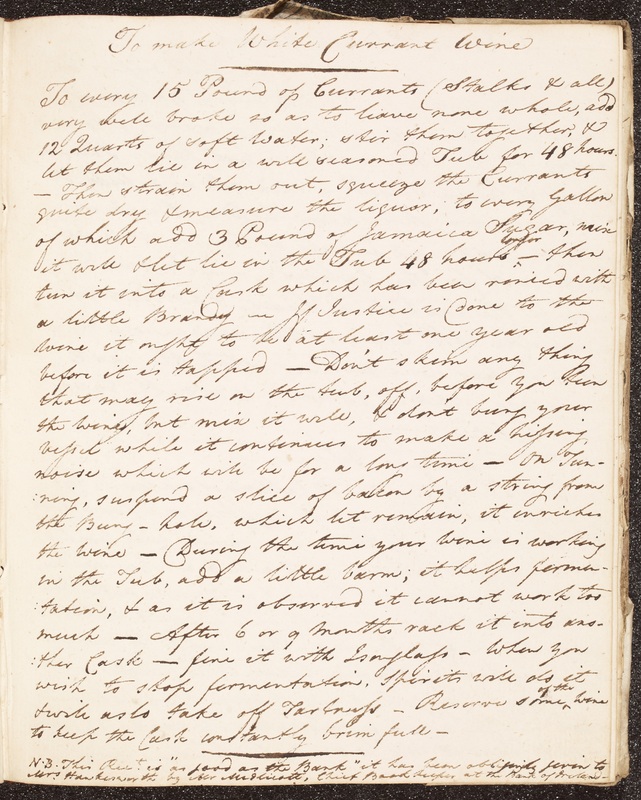 Several years ago a manuscript collection of recipes came up for auction in Dublin. At the time, Ireland was in the throes of an IMF bailout and funding across all cultural institutions was grinding to a halt. This was the background to my suggestion to the National Library of Ireland that they should consider purchasing this manuscript to add to their collection. Several things stood out about it, not least a nota bene attached to a recipe for White Current Wine, which for obvious reasons had particular resonance, and lent a touch of gallows humour to the initial reading of the contents (Fig. 1). There was very little to grasp onto in terms of family history, other than an assertion that a block of the recipes were taken ‘from Lord Buckingham’s cook’, that reference to Mrs Hawksworth in the nota bene and the name ‘C. O’Carroll’ on the inside flyleaf. A trade label indicated that the slim book had been purchased from James Draper of Crampton Court in Dublin, bookbinders and paper merchants who coincidentally were appointed stationers to the Bank of Ireland in 1802. The auctioneer verbally indicated that the manuscript was from Co Limerick. National Library of Ireland, MS 42,105 . The entries span twenty years, 1811 to 1831. The reference to Lord Buckingham’s cook, John Simpson, has added resonance for Irish readers, historically and in the present. Lord Buckingham, the first marquess, was twice lord lieutenant of Ireland, briefly in 1782/3 and subsequently from 1787 to 1789. In this latter period he created, by royal warrant, the Order of St Patrick. The great ballroom of Dublin Castle was renamed St Patrick’s Hall at the time of the first investiture and is known as such to this day. It is the setting for the Irish State’s most significant ceremonial occasion, the inauguration of the President of Ireland, and where Ireland’s most honoured visitors are entertained. Buckingham was also connected to Ireland through his marriage to Mary Nugent, daughter of the 1st Viscount Clare, and died two years after this manuscript was commenced, predeceased by a year by his wife. There is no reference to the fact that the recipes are from John Simpson’s published cookbook itself, from which one could infer that the reflected glory from the provenance of these recipes arises as much from the fact of Lord Buckingham being the Lord Lieutenant of Ireland as it does from being a marquess on a distant shore. Mrs Hawksworth, the other name accorded some weight by the scribe (Fig. 2) may be traceable to John Hawksworth, agent to Lord Castlecoote. One of the estates held by a junior branch of the Coote family through to the early twentieth century was in the townland of Mountcoote, Co Limerick, lending some credence to the intimation that the manuscript was of Limerick origin. Interesting and amusing as the interjections and references to John Simpson and the chief bookkeeper of the Bank of Ireland were, it was the unusual assembly of four remedies for cholera that caught the attention, to the extent that I mentally referenced the collection as ‘the cholera manuscript’ thereafter. Anglophone Ireland was an avid consumer of household and childcare books produced in Britain. There was also a healthy Irish market in reprinting popular British books; the copyright laws did not extend until the turn of the nineteenth century. Information of a domestic nature contained in gazettes, magazines, circulars and other printed material was quickly absorbed into the narrative in Ireland and this collection is evidence of this, notably so in the entries regarding the deadly disease. Cholera morbus is recorded as arriving in Limerick in June 1832. Tellingly, the recording of the first cure for cholera is located between a cure dated April 1831 and another dated August of the same year. This predated the spread of the disease from Britain to Ireland, indicating a heightened awareness in Ireland of impending disaster. This first entry is a close unattributed transcription of one appearing in The Asiatic Journal and Monthly Miscellany of 1831. By March 1832 the disease had struck Belfast and Dublin, and between April and June it was ‘wrecking destruction in Ennis, Limerick and Tullamore’. Subsequent entries concerning cholera are positioned some time after October 1831, indicating perhaps a growing sense of panic in the household. The first of these, an ‘effectual cure for the cholera’, is transcribed as published in both The Lancet and The Isis: A London Weekly Publication. The second is a cure ‘sent by Dr Shanfer from Warsaw to the Prussian Government’, while the final one is via the ‘Hon. Mrs Knox’, attributed to the Asiatic Journal ‘published nearly two years ago’. The disease having progressed through the country, normal domestic life resumes with the next entry, to take out stains or spots upon silk. The Irish state stepped in to secure Bank of Ireland in the form of a state guarantee in 2009. Mary Pollard, A Dictionary of Members of the Dublin Book Trade 1550-1800 (London: Bibliographical Society, 2000), 168. The highest chivalric order for Ireland, established February 1783. The last peer appointed was in 1922. Since the foundation of the Irish state the order is officially dormant, as it was never abolished. Historical Records of the Existence and Progress of Cholera in the City of Limerick During the Months of May and June (Limerick: Edward Deane, 1832). The Asiatic Journal and Monthly Miscellany, Vol. 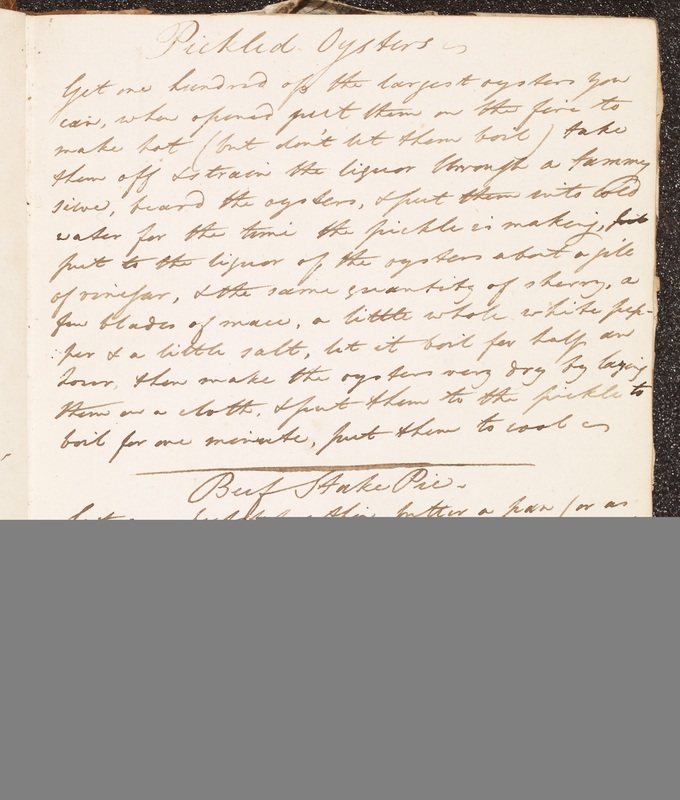 5 New Series May-August 1831, (London, Parbury, Allen, and Co.) The recipe appears to have been copied from Thomas J. Graham, M.D., Modern Domestic Medicine, A Popular Treatise, (London: published for the author, 1827). T. De Bhaldraithe, ed., Cín Lae Amhlaoibh (Cork: Mercier Press, 1979), 135. Sligo town suffered the highest number of fatalities in Ireland or Britain, fifteen hundred in a six-week period. The Lancet, 1831-32 (London, Mills, Jowett, and Mills), 216; The Isis: A London Weekly Publication,[iv] ed. 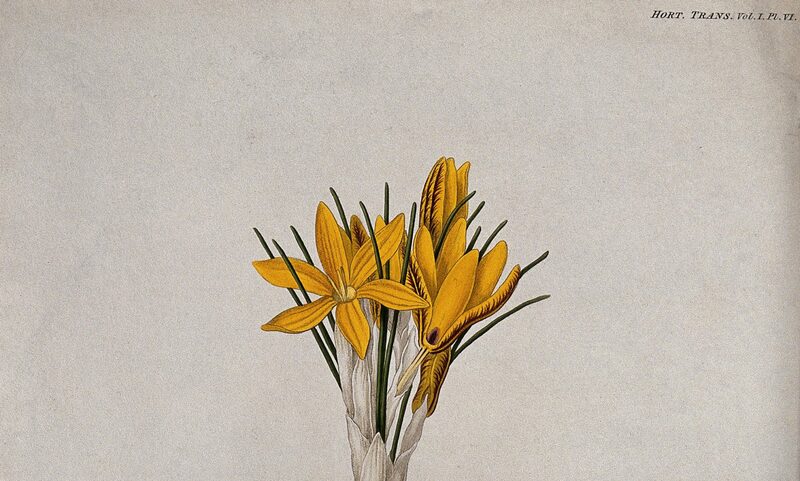 Eliza Sharples, 1832, No 5, Vol. I, 74. The manuscript is un-paginated, the first cure for cholera morbus may be found on page sixty-four of the digitized copy. In its collections the NLI has the most extensive collection of archival material relating to Irish culinary history in public ownership, and the author would like to record her gratitude for their unfailing support in this regard. Margaret Baker, V.a.619, Folger Shakespeare Library. The passage continues by discussing different examples of alchemical transformation and outlining various alchemical processes. Using Early English Books Online, I found the original source of the passage was Thomas Tymme’s 1605 translation of Joseph du Chesne’s The practise of chymicall, and hermeticall physicke, for the preseruation of health. While it is possible that there are untraceable intermediary links that connect Du Chesne’s work with Baker’s, her manuscript also mimics the printed text’s form, separating out each alchemical procedure with its corresponding definition. The visual replication of the printed text signals a close connection between Tymme’s translation and Baker’s transcription. Baker’s receipt book, fol. 133v. Credit: Folger Shakespeare Library. Tymme’s translation of Du Chesne, p. AA4r. Credit: Folger Shakespeare Library. Cross-referencing Baker’s receipt book with EEBO reveals that many of the recipes and passages contained within the volume replicate over a dozen printed sources, including numerous medicinal and alchemical texts. Much of the content is copied verbatim, although some passages have been restructured or given new titles. The most significant change is Baker’s non-standard spelling, which creates deviations that complicate database searches. Undoubtedly, the source texts found using EEBO are a small fraction of the total sources, printed and otherwise, that Baker appropriated when compiling her receipt book. However, identifying these passages illustrates the wide circulation and permeable boundaries of medicinal, alchemical, and domestic texts in early modern England. Baker’s receipt book utilizes a wide array of medical and alchemical texts to construct a distinctively Paracelsian approach to domestic medicine. Apart from these hints about her intellectual world, we know relatively little about Margaret Baker’s life. Her name is preserved in three extant recipe books, but there are no further records about her life. The University of Essex’s “Baker Project” provides a detailed examination of the receipt book, including information and inferences about its author, construction, and provenance. 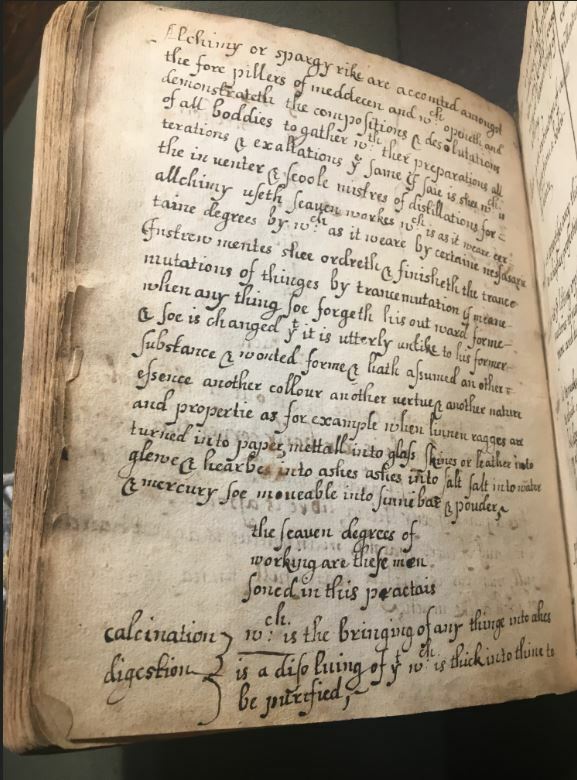 Baker’s receipt book draws from a diverse range of sources: surgery manuals and books of secrets, treatises on Paracelsian medicine and herbals. Alongside English physicians and surgeons, Baker copied English translations of continental writers from Switzerland, Italy, France, and the Netherlands. Additionally, the passages within Baker’s book span over 100 years − from John Day’s translation of Konrad Gesner’s The treasure of Euonymus (1559) to John Church’s A compendious enchiridion(1682). As Karen Bowman thoughtfully observes, Baker’s collection of receipts contains ingredients that illustrate a global market, but the texts contained within her book also point towards an international trade of ideas. Simultaneously, the collection of sources that Baker gathered signals a specific and curated Paracelsian viewpoint. Many of the texts she has collected, including the passage copied from Du Chesne, reference Paracelsus, a Swiss doctor who rejected Hippocratic-Galenic medicine in favor of a chemical understanding of the human body. Paracelsus originally wrote that alchemy − along with philosophy, astrology, and ethics − was one of the four pillars of medicine. Du Chesne, a French physician and alchemist, transmitted this idea into Baker’s receipt book. Both Paracelsus and Du Chesne were associated with female alchemical and medical practitioners, who acted as the syncretic counterparts to university-trained doctors. There is one difference between Baker’s transcription and Tymme’s translation of Du Chesne. 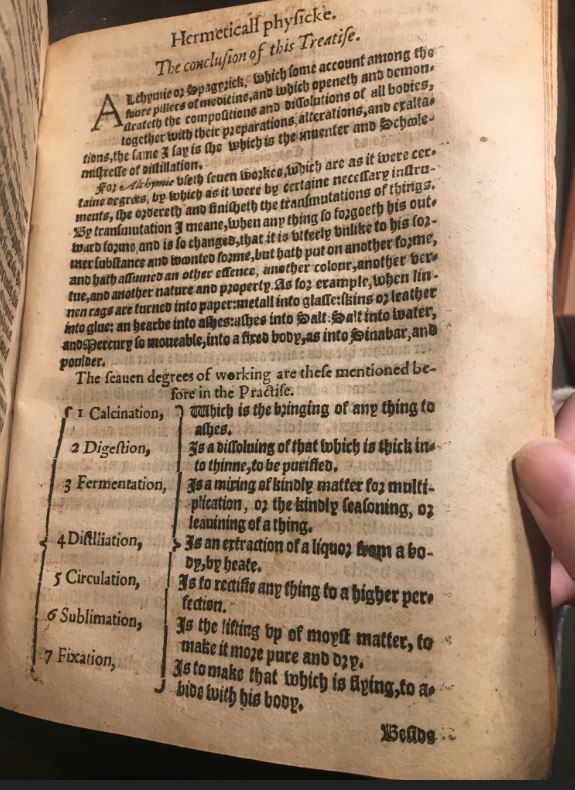 While Tymme writes that, “ALchymie or Spagyrick, which some account among the foure pillers of medicine,” Baker’s version reads, “Alchimy or spargyrike are accointed amongst the fore pillers of meddecen,” removing “which some account” making alchemy’s foundational place a certainty. Since Paracelsian medicine became increasingly popular in England over the course of the seventeenth century, this change could reflect a larger cultural shift between Tymme’s translation and Baker’s transcription. By definition, receipt books collect received knowledge, inherently entangled within dynamic social networks. Baker’s book is an assembly of ideas that she “received” from an impressive number of sources, both printed and unknowable. Even though Baker is not the original author of passages identified, she has a hand in constructing their shared meaning: a distinctly Paracelsian and thereby chemical approach to medicine. Acknowledging the sheer number of choices necessary for the book’s construction sheds a light on her role. For every passage she chose to copy over, she omitted hundreds, if not thousands, of additional recipes and treatises from her printed source material. Her role as the compiler was not only to receive knowledge, but also to choose what knowledge should be preserved on the page − what knowledge we, as readers, in turn, receive. In 2017, the academic journal Global Food History published a roundtable on “Teaching Food History.” Participants, including one of this month’s contributors Jeffrey Pilcher, described the exciting outcomes and periodic challenges of developing food history courses. This includes the use of recipes in the classrooms as a means to consider silences in the archives; grapple with questions of material history; and to think about (and experience) issues around labor, production, and supply. 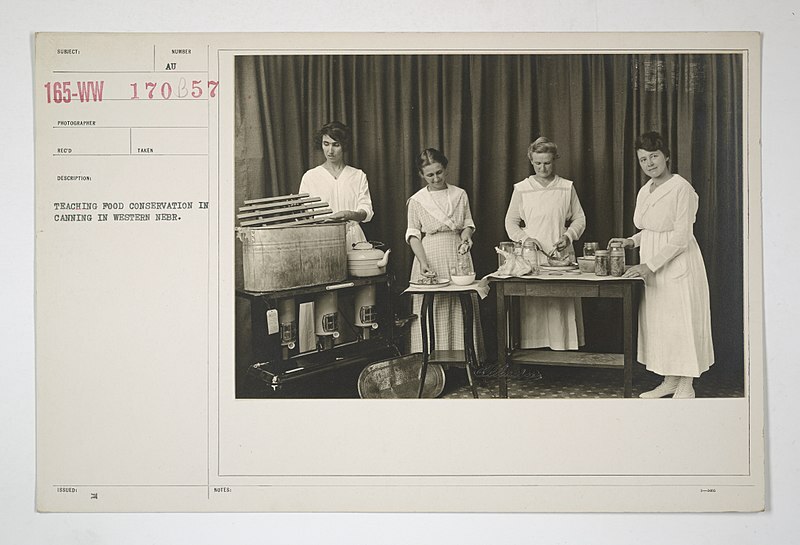 “Food Administration – Education – Teaching food conservation in canning in Western Nebraska,” 1917-1918, National Archives at College Park, Courtesy of Wikimedia Commons. All through the month, we’ve had the pleasure of extending these conversations, featuring different approaches to teaching with recipes. As our contributors have shown, recipes represent an exciting and accessible form that encourages students to think in new ways about reading practices, but also histories of class, gender, and global exchange. This month’s Series means that we now have some 24 posts on teaching available on the site. In this final post of September 2018, we’ve listed these resources for our readers, categorized by approach and topic. Some of them date to 2014, when Amanda Herbert first launched the Series. We hope this makes our teaching resources even more accessible for educators and will encourage the use of recipes in the classroom. And, as always, we want to hear from you about how you use recipes in the classroom! Please join us in the Comments section to continue the conversation. 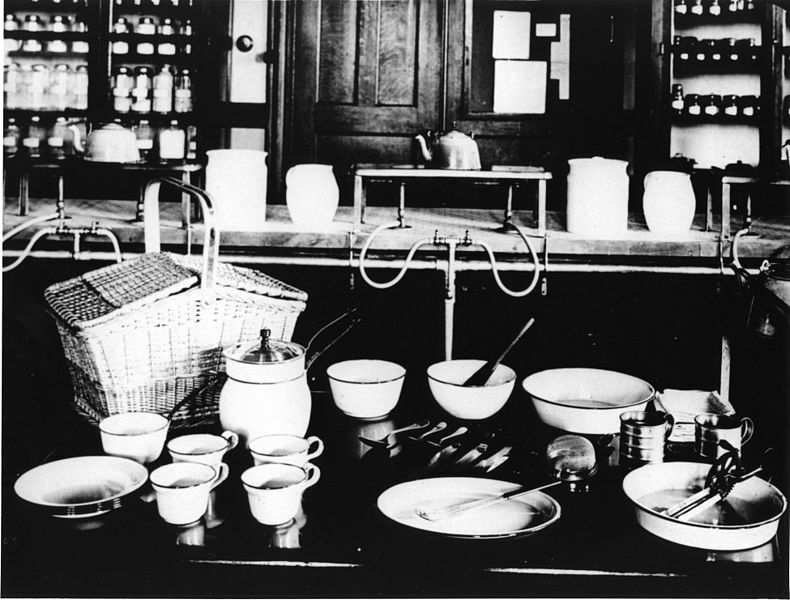 Foods and Cookery laboratory, School of Household Art, Teachers’ College, Columbia University, 1910-20. From Collection #23-2-749, item M-OS-08. Cornell University Library. Courtesy of WikiMedia Commons. Beth Forrest et al, “Teaching Food History: a Discussion Among Practitioners,” Global Food History 3.2 (2017): 194-208. 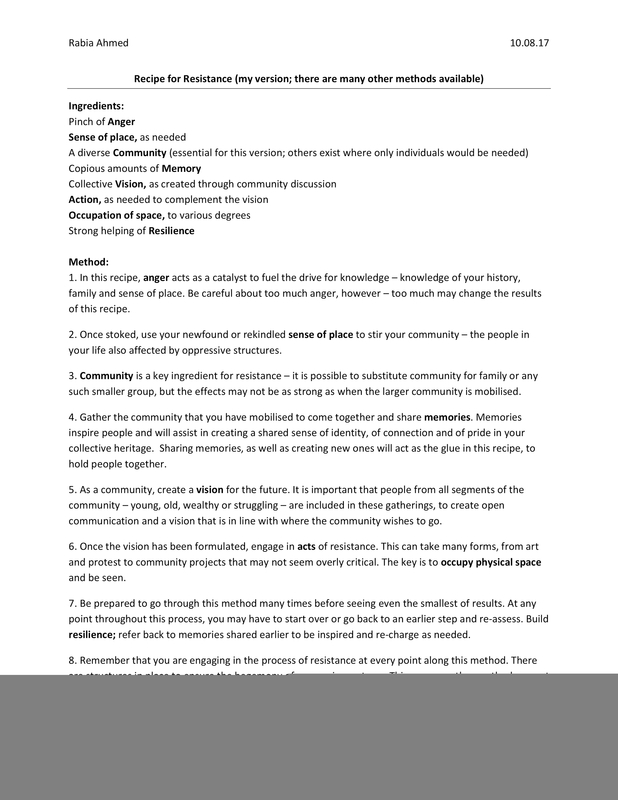 In today’s post, Lisa Myers describes the possibilities in using recipes as a teaching tool to explore ideas about power, social relationships, and connection. During breakfast at the gas station/restaurant in Shawanaga, the reserve where my mother was born, my family’s conversation revolved around food memories. The soup and skaan special roused a discussion of how our Granny made the best skaan (pronounced “skawn,” also known as bannock or fry bread). That skaan was so good, I almost convinced myself that I would never be able to make it that well. My sister explained that her own skaan always came out hard as a rock. Uncle Sonny piped up, “I know how to make scone,” and started listing off measurements: “three cups of flour, three heaping teaspoons of baking powder, some salt, then you add some water, and don’t mix it too much.” My sister turned to me and responded by asking me to show her how to make it because she needs to do it with someone to get the feel of it. Confirming food’s capacity to connect people with places, history, and a sense of cultural identity, the common understanding of this simple food was enriching. There is a tension in recipes that written instructions are not enough or that somehow the maker will miss something or not do something integral but omitted from the text. Seeing someone make it carries more nuance and offers reassurance. This simple recipe represents ingredients from mere rations, and the preparation of such ingredients show the resilience of Indigenous people across North America, but also as traces of colonization since there are simple breads like these across the globe. 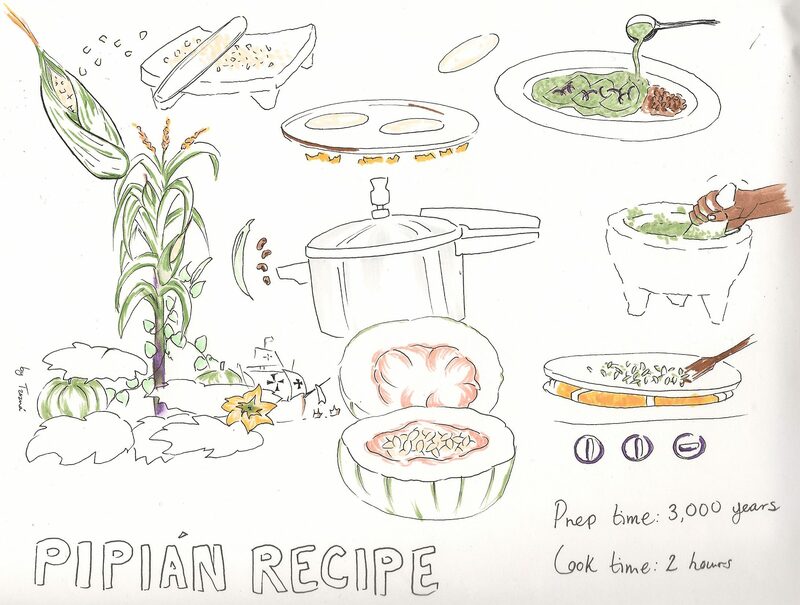 “Pipian Recipe.” Courtesy of the author. “Recipe for Resistance.” Courtesy of the author. A section of this text is from: Lisa Myers, “Serving it Up,” The Senses and Society 7:2 (2012): 173-195.